There's a new book out about a young man who accepts a bet that he can visit all of the stations of the London Underground (the subway) in one day. 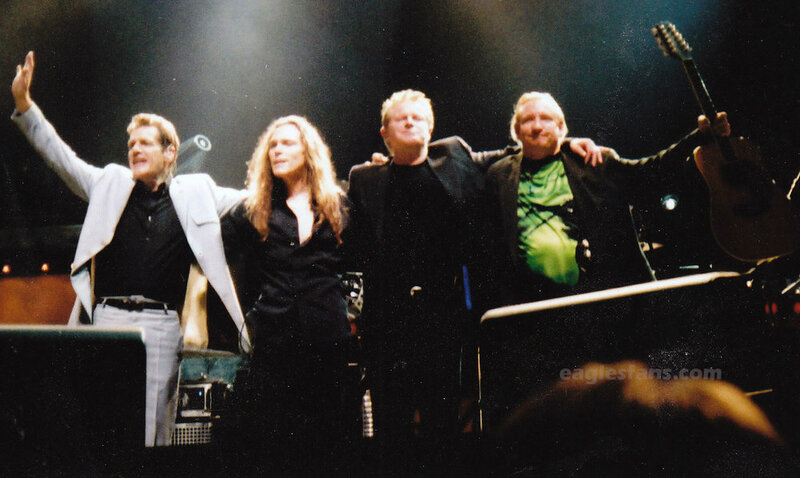 While we may not have achieved a journey as extensive as that, our trip to London this summer to attend all of the Earl's Court shows revolved heavily on London's fan­tastic transportation system. Those of you from England may find it funny that we Americans are in such awe of your sys­tem of tunnels, stations and trains, but aside from some of our larger cities, we really have nothing comparable. 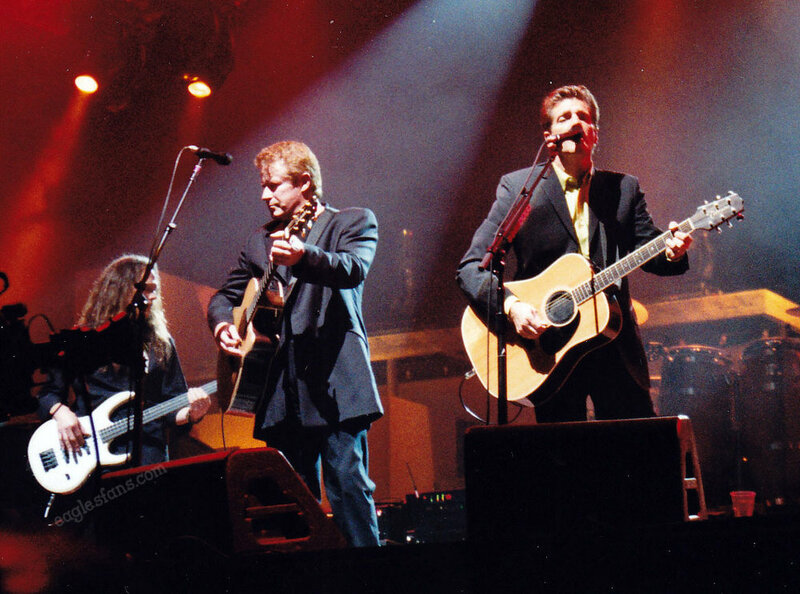 Going on road trips to Eagles' shows in this country invariably involves renting a car, driving unfamiliar streets and struggling with the unending questions of 'Where are we going to park?" and "How much will it cost"?? That wasn't the case with this summer's shows....not at all. Through it all, the Underground was our friend. Heathrow Station All of us had been to England before. We'd done that ex­change-student thing back in college and had always said...we'll go back someday. 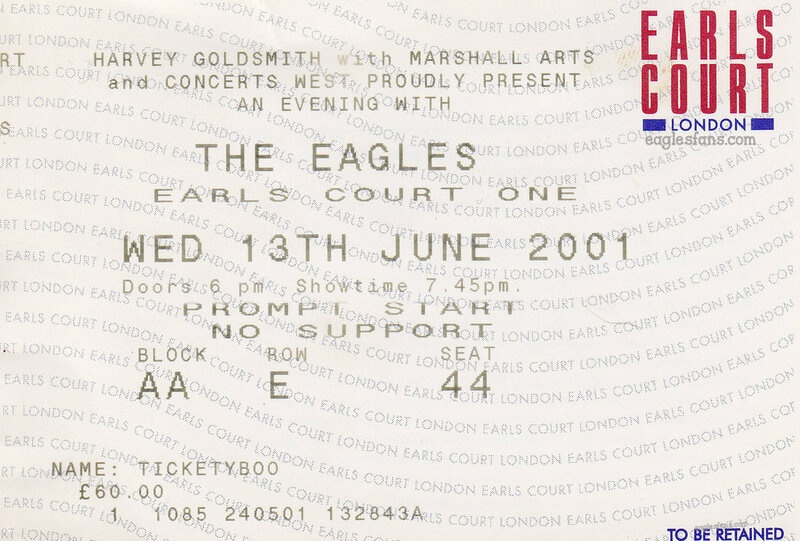 Well, four Eagles' shows at Earl's court provided just the right incentive to get out the credit cards and hop on a plain for jolly ol' England. Upon arriving at Heathrow, everything started coming back to us. The first thing was the massive amount of walking one has to do! Here in America we are used to walking short distances. We play parking space vulture to get just a few more feet closer to the grocery store door. But in England you walk. You walk and walk and walk. And we did walk all through the maze of corridors below the airport until we boarded our first train. We had procured weeklong travel passes before we left so we didn't even have to worry about buying tickets. We pulled our lug­gage onto the train and sat for the ride to our hotel. We didn't miss the irony that our car was shared by 3 20-somethings with backpacks trying to figure out which hostel to stay in. We had been there and done that. This time we were going to be staying in a real hotel! Paddington--District Line Station Know­ing how things usually work out for us we were prepared to have a huge hassle find­ing the hotel and hooking up with Michelle whose plane had come in at Gatwick air­port. Well, we departed the train at Pad­dington and climbed up to street level. What a funky neighborhood! There were ethnic restaurants, places to exchange money and yes! a MacDonald's. The Ugly Americans in us knew that we'd at least be able to get a cheeseburger if we needed one. After turning our map around a few times, we found that the Shakespeare Ho­tel was only a few blocks away. The Shakespeare was located across from what looked to be three or four townhouses that had all been connected. The staff was cheerful and kind and we huffed our bags up to the room. What can we say about the room? We each had our own bed. We had a TV. We had a balcony that looked out over a quaint park and we had a toilet in our room. Those who have traveled to Europe know that you sometimes have to specially request bathrooms en suite. Well, this bathroom was the size of a closet. If you were lucky you could maybe turn around. Over the course of the week, we would all master the art of getting dressed in about a 2 foot by 2 foot bit of space. The Eagles were worth it, though. Bags secure, we then headed back to the train station to find Michelle. We were ap­prehensive about actually being able to do this. Here we were...thousands of miles from home in one of the largest cities in the world hoping to find a friend at a train station. Well....it worked. We had no prob­lems finding Michelle and getting back to the hotel. Warren Street Station--Victoria Line After getting our bearings in the hotel, we were off on our first adventure. We had to meet Eric. Eric was the nice broker that we had gotten tickets from. Eric had given us directions to his office which was right on top of the station, but we messed up and ended up walking all the way down to Euston Station and back. Finally, we found Eric and got our tickets. Hurray! Waterloo Station--Northern Line This area of town brought back memories. When we were in England the first time we had attended college at King Alfred's Uni­versity in Winchester which is about an hour south of London by train. When we'd come into the city, we'd disembark at Wa­terloo and walk along the river to Parlia­ment or the Embankment. What a change this part of the city had undergone. The whole stretch of the river used to be (at least in our memory) little shops...record shops (where I distinctly remember buy­ing the Chris Rhea Road to Hell album back in 1989.) These stores were all gone. Now the Millennium Wheel was there. We went up to get a bird's eye view of the city despite my incredible fear of heights. I did okay and enjoyed the ride. Also missing was the shop right as you cross Waterloo Bridge (and across the street from Big Ben) where we had gotten our tickets for our very first Henley show. How sad! This is now a very nice office build­ing . We did some other tourist stuff be­cause we didn't have a show that night. We went to the Tower where I renewed my infatuation with Richard III, visited Winston Churchill's War Cabinet Rooms and had some of the best Mexican food at the Texas Embassy Cantina near Trafal­gar Square. By the end of the day, our feet felt like they were going to come off. Notting Hill Gate--District Line We had a how this evening so we didn't want to exhaust ourselves too much. We started the morning by going to the market at Not­ting Hill. We looked for the house with the blue door made famous in the Hugh Grant movie, but must have missed it. We did buy some collectable treasures, though! We decided this was to be shopping day so we headed off to Covent Garden and the Doc Martin store. New shoes all around at much cheaper prices than we'd pay in the states! Earl's Court Station--District Line Show time! Since we saw four shows and they've kind of blended into one we'll tell you about a little bit of the show for each night. We were very excited about this show...having heard advance reports from Moscow and Scandinavia. Our seats were close to the stage but in the raised section on the side. We did, though, have a great view. When the band took the stage, the crowd went pretty wild and the reason for being so far from home became evident. Seven Bridges Road What a great way to start a show! Only four voices harmonizing tightly. They sounded great. 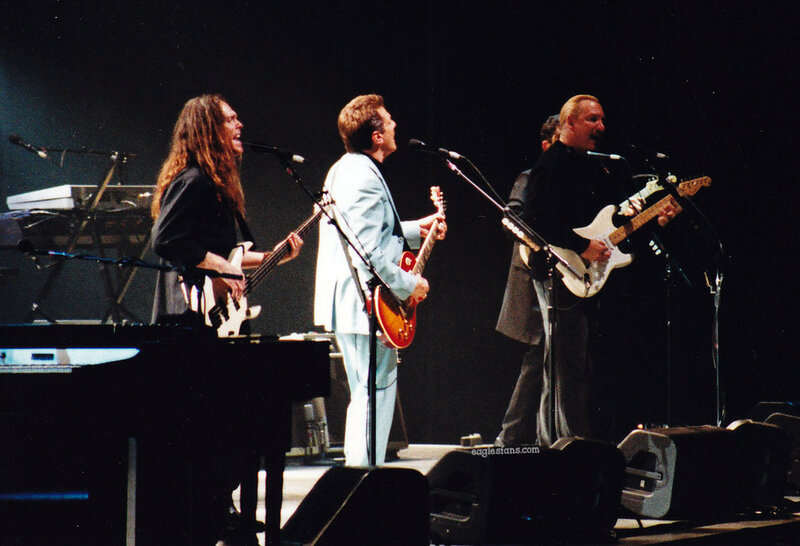 The Long Run This song has bene­fited from Henley's solo tour. He grabs the microphone and strolls around the stage belting this one out with a strong horn section accompanying him. This probably would have done better further along in the show, but it did get things off to a rocking start. New Kid in Town This is where the band went back to the set list from the HFO tour and started doing numbers from the Hotel California album. This one could have benefited from a bit of a reworking as it sounded the same as it did back in 1996. Wasted Time Don just gets better on this. His voice was a tad raspy, but that only lends to the magic of this number that he performs pretty much on his own with a spotlight shining just one him. Peaceful Easy Feeling Who likes Country Music in London? Apparently the crowd! This num­ber had everyone singing along. Pretty Maids. Joe is up to bat. Again, this was pretty much the same as it was in 1996. The thing about this song is that you don't really think that it will work live...but it does and sort of serves as a commentary from the band. "Hi there, how are you? It's been a long time ... "
Love Will Keep Us Alive Timothy did a great job as usual. Something must have happened during rehearsals be­cause every time they came around to the "I would die for you...." line Henley and Frey would look at each other and look like they were sharing a kind of private joke and almost crack up. Tim is well liked in Europe. One night a woman had a banner offering to meet Timothy "...at the top of the stairs". Piccadilly Circus--Bakerloo Line The morning started with us at Piccadilly station hoping we could find a one hour photo place so we could see how our photos turned out. It was Sunday and not much was open. We lucked out and found a tiny shop right in the station run by a very friendly Indian gentleman. His store may have been even smaller than our bathroom in the hotel but he did an Amazing Job with our photos. He talked to us about film some great photos of the show. He was astounded by our reasons for coming all that way to London, but wasn't mean about it. If you live in London and need some quality film processing, check out the little stand in the Piccadilly Circus station! Covent Garden--Piccadilly Line As we've said time and time again, one of the best parts of being an Eagles fan is meeting up with fellow fans. Well, this was no excep­tion. A group of us met at the Punch and Judy pub at Covent garden to share sto­ries. Emma, Mark, Sue, Allison and we en­joyed dinner. We were joined by Tina from Denmark and some of her friends making this a truly international affair. We all got on the train together (by the way...for those who hate steps as much as I do, the Covent Garden station elevators (lifts) are very much appreciated! Earl's Court Station--District Line This night Lisa and Michelle sat dead center in the 2nd row (and fended off stares from Glenn when they took out the camera) and I sat up on the side with Emma and Paul's father. He was a great companion for the show! I may not have had the best view of the stage, but I had a great view of the comings and goings backstage. Irving Azoff was showing around what looked to be VERY important visitors. They were given the royal treatment...getting to walk up to the edge of the stage in front. Taylor and Deacon Frey were having a great time hitting each other with their backstage passes (typical kids....very cute) and at one point, Cindy Frey and Taylor danced to­gether. They seemed to be the only family in attendance at that time. More show notes! Boys of Summer Great reception for this solo hit. The band had fun once again reprising their hopping lineup from 1996. Lots of dancing in the au­dience! 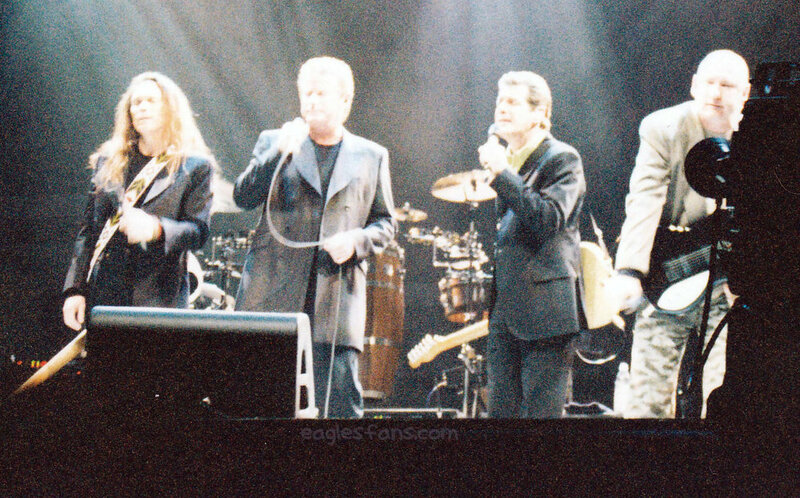 Take it to the Limit We said this back at the millennium, but this song is AMAZING with Glenn on lead vocals. Never a fan of the Randy version, I'm a true convert now. The entire audi­ence sang along. One of the high­lights of the evening. Best of My Love This was the jazzed up version from the Millennium shows. Very nice and very much appreciated by the audience. Already Gone Glenn dedicated this to our president George W. Bush and said he hoped they could sing this to him in 4 years. Damn! Why hadn't we brought an American flag to wave?? in the City Another Joe showcase. Nicely done. One of These Nights Don still has it vocally! All of the high notes were hit. Time for intermission!!! Holborn Station--Central Line One of our "must sees" in London this time was the British Museum. As people who teach world cultures to kids, we wanted to see all of the wonderful artifacts that show up in photos in textbooks. We looked at mummies and Celtic stuff, took pic­tures of the Rosetta Stone and naked Greek Statues (cleverly edited, of course). We also went to Harrods for a bit of shopping, got our photos devel­oped at a Boots pharmacy, and ate again at the Texas Embassy Cantina (great fried chicken and Dr. Pepper in the bottle!!!) We were pretty tired. We probably went to an Internet Cafe and we caught some British television. At one point we watched a great docu­mentary about ordinary men living like Roman Soldiers and Weakest Link. Ann Robinson is MUCH nicer to the British con­testants! Barbican Station--Metropolitan Line Our guide books told us not to miss the Mu­seum of London and we were glad we did­n't. This is a fantastic museum (we recom­mend the Great Fire diorama). It was also neat to see British kids on a field trip. The teacher in us wanted to correct some of the kids who were messing around, but we realized their teachers were on the ball. "You don't want to get on the List, do you?" This "List" seemed to strike fear in the hearts of the young students. The Museum of London also has a great book shop where we purchased a bunch of "horrible history books". 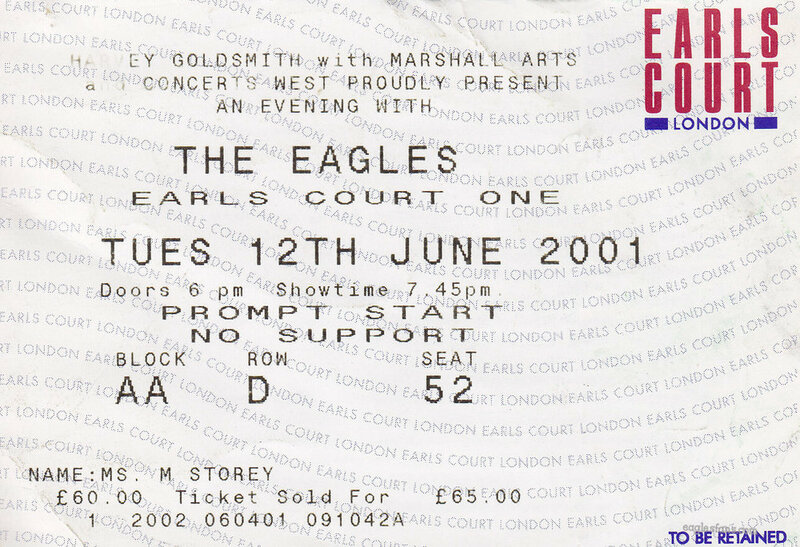 Earl's Court Station--District Line This night we sat in the 4th row on Joe's side of the stage. A word about the merchandise. It all seemed priced pretty much in line with what we've come to expect. Lots of nice t-shirts, a black baseball jersey, signed Hotel California prints, key chains and coffee mugs!! It's kind of weird to be in line buying a t-shirt and see someone you know...but there was Mike...we had sold him some of our extra seats to the solo Henley show in Vegas last year. It really is a small world11111 The highlight of this show was having Henley recognize us (we had seen him several times last year...backstage in Phoenix, the NARAS thing in Austin, the Wildflower festival). We waved and he saw us. He kind of had this incredulous look on his face and then broke out into a big smile and waved back. How pathetic are we? Hotel California A lot of fans were apprehensive that the band would be doing this a la mariachi like at Henley's solo shows. They struck a nice balance between the new and the old, though. The song started out with an Al Garth trumpet solo and then turned into the classic arrange­ment of the song. If you were too long in the loo, though, you missed this great song. Lyin' Eyes Great number. The crowd sang along. I Can't Tell You Why Is it possible for Tim to mess this up? Probably not. A few words on new guitar player Steuart Smith. 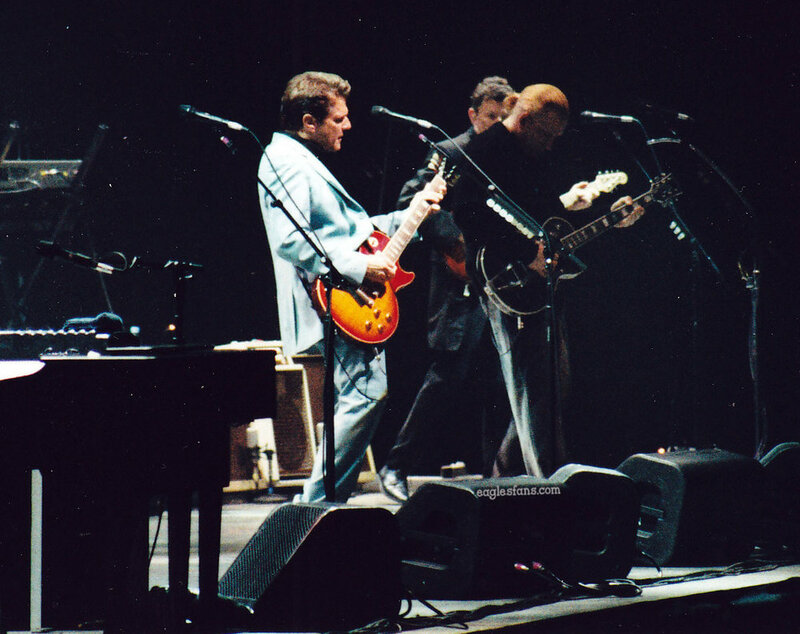 It was obvious he wasn't Felder but his solo on this was great just the same. Walk Away Wow! 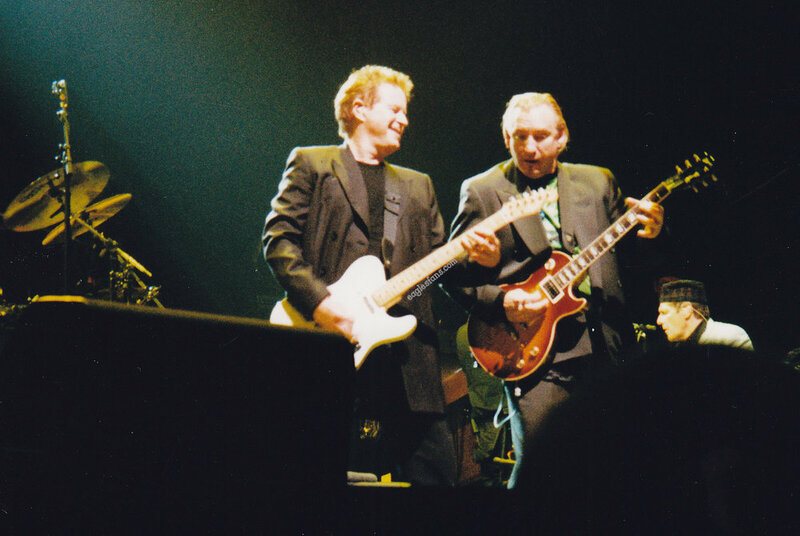 With the horns and Glenn and Joe both shouting into the microphone, this is a rocking number! Tequila Sunrise This has turned into one of our favorite songs. There is a time during this song...on the line "Oh, and its a hollow feeling...." when Don and Glenn turn and look at each other. They do it every time without fail and it is our favorite moment of the show because it exemplifies all of the reasons why we love this band. Wow! Sunset Grill This give us a chance to talk about the lighting of the show. Beautiful jewel tones set the stage all through the show and you can tell careful thought was put into the light­ing design. Pinks and oranges were used for Tequila Sunrise and then shifted to purples and blues for Sun­set Grill. Clever!! You Belong to the City Glenn's do­ing this one a bit slower. and we're not sure if it works. We miss the intensity of the 96 version. When they were in the 2nd row, Lisa and Michelle got to witness firsthand all what comes out of Glenn's mouth when he sings. It was kind of gross. Life's Been Good Usual Jokes...you've heard them all before. Warren Street Station--Victoria Line Okay, we have a really good reason for going back to the ticket broker. We had okay seats for the last night, but this sick­ness sort of comes over us when it comes to the Eagles. We just couldn't sit far back for the last show. So, Michelle got out her credit card and we ended up with seats in the 5th row center. We won't tell you how much we paid. Let's just say that now in almost November, we've finally paid off all of the travel related expenses. Anyway, we spent today just packing and resting and getting things in order to go back home. We were pretty ready to leave. It's hard being away from your stuff for lengthy peri­ods of time. Earl's Court Station--District Line Have we mentioned how cool it is to be able to take a train directly to and from a concert? You end up on a train of fellow fans and it is a blast! Anyway, this was the last show. 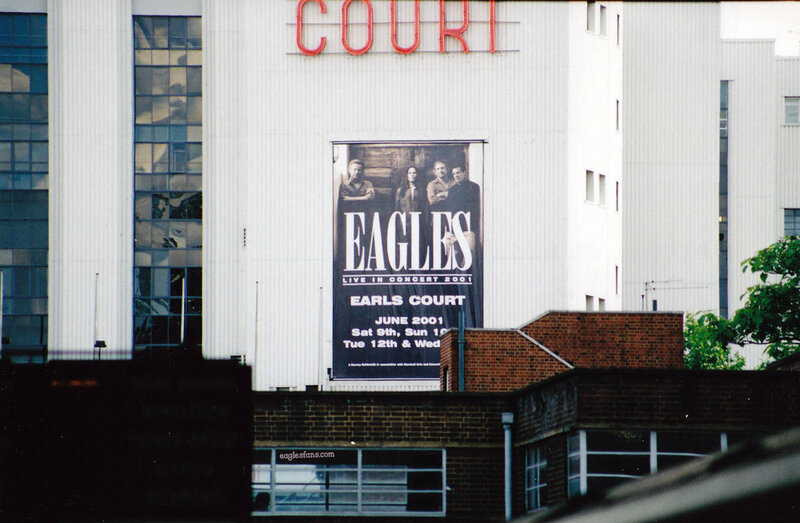 All over town were these posters telling people that these were the farewell shows and that you would never be able to see the Eagles ever again. Henley put that to rest during the shows saying that they weren't finished yet. Dirty Laundry Again, this is a show­case for band camaraderie. They all play off of each other and hop around. Don dedicated this one to British me­dia tycoon Rupert Murdoch, but he would have been better off dedicating it to the tabloid that told everyone what hotel the band was staying at. Funk 49 Once again, the horns make this number. Fan-freaking-tastic. Heartache Tonight Never had the words "This night is going to last for­ever....last all summer long..." seemed so true or so poignant. Life in the Fastlane Fever pitched frenzy. What more can we say??? Rocky Mountain Way Can Joe do this number in his sleep? Just wondering. All She Wants to Do is Dance The camera crew still amuses itself by finding particularly ummm voluptuous women to showcase on the screens during this song. Take it Easy Show's almost over. The crowd really gets into singing along. Desperado That's all she wrote. Great vocal by Henley who thanks us for 30 years of support and then the show is over. Time to head out back to the train station. This last night we had our only problem with the trains. There's a problem and they make us get off the train at Bayswater. Before we can decide what we're going to do, though, they announce the train is back running. Hurray! Hyde Park Corner--Piccadilly Line Time to go home. We bid farewell to our home away from home at the Shakespeare. We decided not to shlep our bags all over the underground and instead got a cab with the miniscule proceeds of unloading our original seats for the 14th show. Our taxi driver was friendly and had lots of ques­tions about the American President. He seemed incredulous (as are we) that Bush had won the election. He dropped us off at Hyde Park Corner (and took Mi­chelle on to Victoria) so that we wouldn't have to change trains before Heathrow. We've left off many of our adventures (like the boat trip on the Thames, the McBacon sandwich with special Brown Sauce, shopping on Oxford Street for size A4 sheet protectors (don't ask) and other boring tidbits). Our only regret was that we wouldn't be able to stay for the Timothy autograph singing at Tower records that night. We got off the train and said good­bye to the tube. It had been a faithful friend for our trip. Despite sometimes feeling that we had walked forever or that we had de­scended into the bowels of hell (the West­minster stop) when we think of the Eagles and London, we'll think of the tube as well.